We are very fortunate and rejoice that Kyabgon Phakchok Rinpoche will continue giving Empowerments from the Tukdrub Barche Kunsel Cycle, which he started on 2015 and continued on 2016. 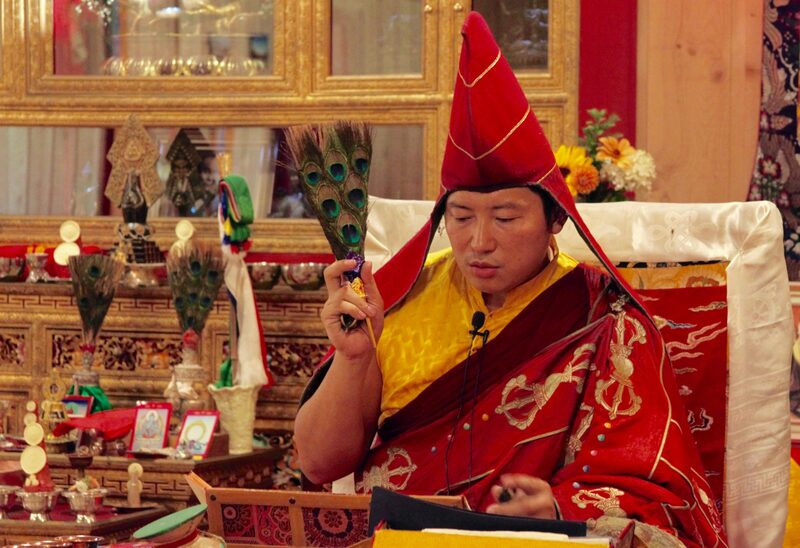 This year the Empowerments that will be bestowed are: Gyalwey Dungdzin, Mawey Senge, Lama Norlha and Dükyi Shechen. The Empowerment will take place at 2pm on Sunday August 13th. The fee for participating in the ceremony is $30USD*. It includes lunch that will be served at 12:30. 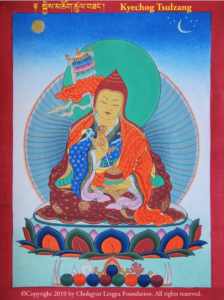 It does not include the Dana to Rinpoche. *Please register sending an email to [email protected] – If you are attending the Mahamudra retreat at Gomde, you are already register and your fee is covered. Our wish is that anyone with genuine interest in dharma can attend the teachings and events; financial issues should not be a reason for not being able to participate in a program at Gomde Cooperstown, so please contact us in case of need. 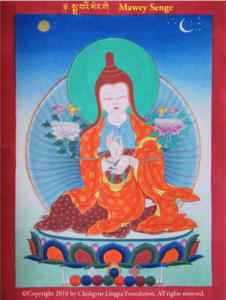 Gyalwey Dungdzin: Gyalwey Dungdzin is one of the eight manifestations of Guru Rinpoche, called Lotus King. He is the deity of magnetizing activity. His practice brings the three realms under one’s control and enhances the magnetizing and wrathful activities of yogic discipline. Mawey Senge (Peaceful and Wrathful): Mawey Senge is an emanation of Manjushri, the deity of wisdom, and is also inseparable from one of the eight emanations, called Loden Choksey. His practice develops intelligence and insight. Lama Norlha (Kyechok Tsülzang): Lama Norlha is the God of Wealth. He is one of the twelve emanations of Guru Rinpoche in the Thukdrub Barche Kunsel, seated on the lotus petals around the central figure. His practice brings about all desirable things and fulfills all wishes. 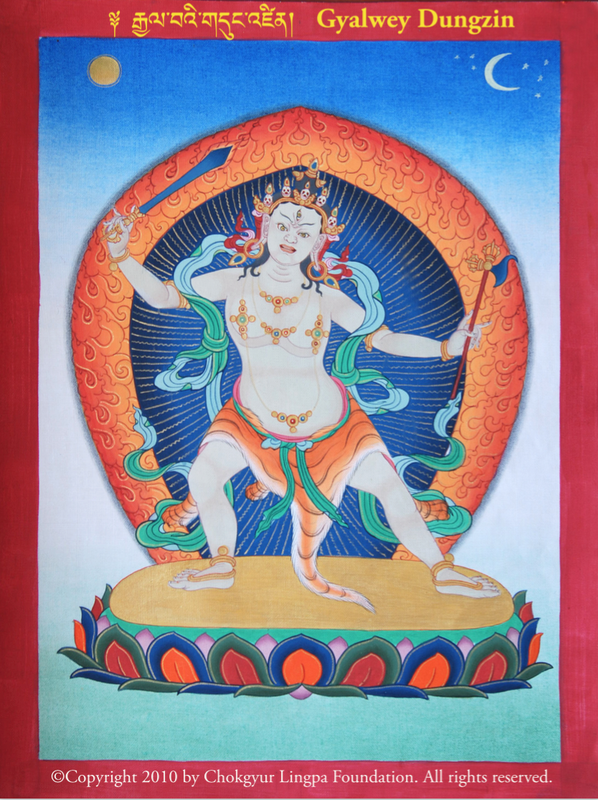 Dükyi Shechen: Dükyi Shechen is the deity of awakened activity, and is indivisible from the yidam Vajra Kilaya (Dorje Phuba). 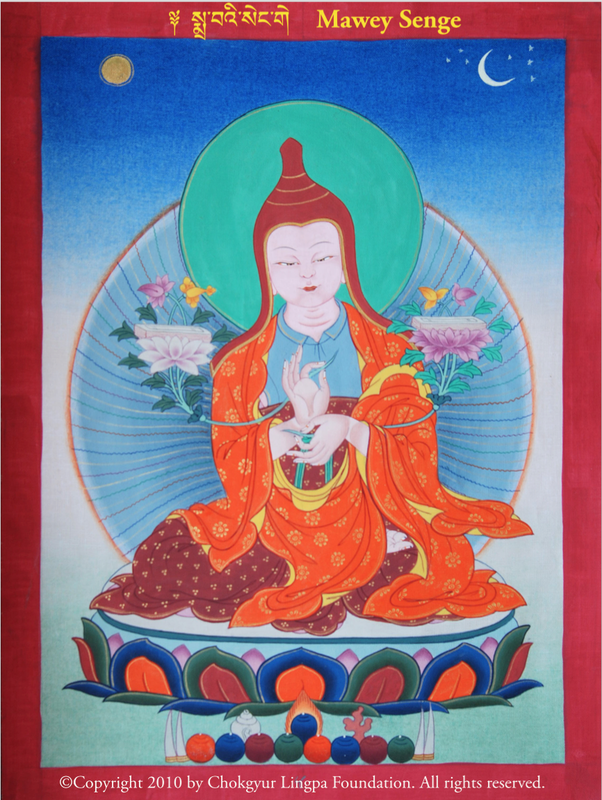 He is also one of the emanations of Guru Rinpoche seated on the lotus petals around the central figure. Please find below an extract from the newly published book The Great Tertön with more information about the Thukdrub Barche Kunsel cycle. “The disciples — including Trisong Deutsen as lord, Vairocana as subject, and Yeshé Tsogyal as friend —reflected on his words. They saw that this was true, that for removing obstacles there was indeed no practice greater than guru supplication. Their thoughts continued: ‘Our root teacher, who took birth intentionally in the form of a Vajra Master, is Guru Rinpoché. He is the one who has granted us empowerments and teachings. 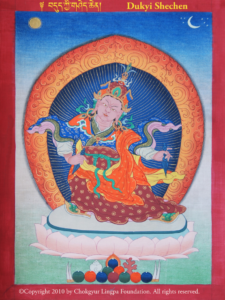 Moreover, he has said himself that, just as Avalokiteśvara is the deity with a special karmic connection to Tibet, he, Padmasambhava, is the master most closely connected to Tibet. Through his compassion, and as a result of aspirations made in the past, he deliberately took rebirth with the purpose of training beings in this land. Padmasambhava is thus, without a doubt, our guru. Therefore, we need a special method for supplicating him.’ With this in mind, they requested Guru Rinpoché to teach them such a practice. Dharmakāya Amitābha, to you we pray! “When he had granted them this previously unknown prayer, the disciples all thanked him, but added: ‘We think there must be a method of accomplishment (sādhanā) related to this, complete with activity practices. Please teach these — not only for our sake, the disciples present at this moment, but in particular for the sake of future beings with devotion to Guru Rinpoché.’ With this, they offered him their bodies, wealth and possessions, requesting him to teach. “Instantly, Guru Rinpoché transformed into Nangsi Zilnön, the Master Prevailing Over All that Appears and Exists, the lord of the maṇḍala. Surrounding him were other deities such as Tsokyé Dorjé (Lake-born Vajra), Padmasambhava, and all his manifestations. Above Nangsi Zilnön’s head was the sambhogakāya four-armed Avalokiteśvara, and above Avalokiteśvara was the dharmakāya Amitāyus. In attendance around him were all twelve emanations of Guru Rinpoché, and at the four gates of the maṇḍala were the four ḍākas in union with their consorts. Guru Rinpoché emanated this entire maṇḍala instantaneously, and granted his disciples the empowerment. And if we practice approach and accomplishment, that will be excellent indeed! And the door to the lower realms will be closed to us forever. “He then prophesied the future lives of Chokgyur Lingpa and Jamyang Khyentsé, saying that, during their time in Tibet, other teachings would be losing their power due to the damaging influence of samaya breakers. This would be the appropriate time to propagate the teachings of The Dispeller of All Obstacles. Moreover, he gave precise details regarding the exact location where the teachings should be concealed, and the method for doing so.